However, as any copywriter knows, creating a high converting sales page is anything but easy. It’s actually one of the most challenging things you’ll ever do. The goal of a sales page is to convince people to purchase something. How do you convince people to spend their hard earned money? “Build a rock-solid argument that gets your prospect to ‘realize’ he has a big, burning problem and that your product is a life-changing, miracle cure that will solve his problem,” marketing expert Clemence Lepers says. 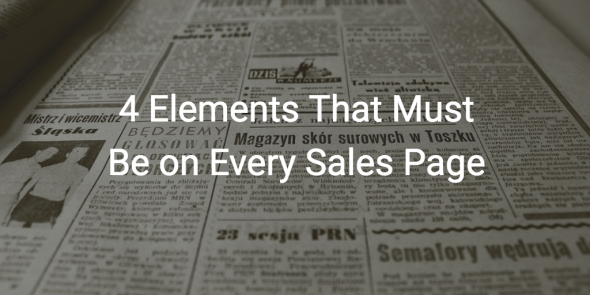 In other words, the sales page headline is unbelievably important. Without the right headline, you risk running visitors away or confusing them in regards to what the page is offering. As humans, we are heavily influenced by what others think, say, and do. Thus, if we see that people are speaking highly of a certain product, then the status of that product is automatically elevated in our eyes. It doesn’t really matter if we have no experience with it on a personal level. The mere fact that others approve makes us more likely to approve ourselves. Social proof comes in all shapes and forms – and much depends on the information you have access to. This sales page from The Grooves, a San Antonio-based wedding band, shows how client testimonials can increase the value of a page. This landing page from Muck Rack, a tool for connecting marketers with journalists, shows the value of including familiar logos of companies using the product. There’s ample room for flexibility, but don’t ignore the power of social proof. The worst thing you can do is confuse a sales page visitor. You only have a few seconds and a couple lines of text to win the visitor over. If you confuse them by presenting multiple calls-to-action, then you’ll risk running them off. As a rule of thumb, you should always include exactly one call-to-action on a sales page. It’s okay to include the same call-to-action in a couple different places (even with different wording), but the action step must be consistent. Having a call-to-action is one thing, but why should visitors follow through? You must provide visitors with a reason to believe. Does the mere fact that you’re including all of these elements in a sales page mean you’re going to have a high conversion rate? Not necessarily. However, it does increase the likelihood that you’ll persuade your target visitors – and that’s the goal!